Posted on 10, August 2016 by EuropaWire PR Editors | This entry was posted in European Union, Ireland, Science, United Kingdom and tagged astrobiologists, Earth’s surface, EU, MASE, study Mars-like environments on Earth. Bookmark the permalink. 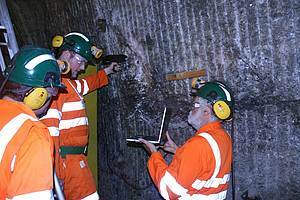 DUBLIN, 10-Aug-2016 — /EuropaWire/ — Recently, a team of astrobiologists from the EU funded MASE (Mars Analogues for Space Exploration) project descended 1.1 kilometers below Earth’s surface to the Mars-like environment of the Boulby Mine in the UK looking for answers about life on other planets. Six members of the MASE team headed to the mine on the North East coast of England to study ancient formations of honey-comb like hexagonal patterns that were formed 250 million years ago. Similar geological formations have been observed on Mars and the analysis of these rocks will help future space missions to better identify potential sites to look for biosignatures. The objective of the campaign to Boulby Mine was to collect solid samples to study their composition whilst at the same time testing different life-detection instruments that can be used to study salt deposits on Earth and elsewhere. The campaign was also part of the UK Centre for Astrobiology’s MINAR (Mine Analog Research) work that seeks to advance science and technology for planetary exploration using the mine. The overall aim of MASE, a collaborative, four-year research project supported by the European Commission’s Seventh Framework Programme (FP7 – Grant Agreement n° 607297), is to provide new insights into the adaptations of life to Mars-like conditions and the potential preservation of their biosignatures. The European Science Foundation (ESF) leads the co-ordination and dissemination strategy for MASE which is running from January 2014 to December 2017. The Mars Analogues for Space Exploration project is supported by European Community’s Seventh Framework Programme (FP7/2007-2013) under Grant Agreement n° 607297. The MASE consortium consists of Charles Cockell (The University of Edinburgh, UK); Petra Rettberg (The German Aerospace Center, Germany); Ricardo Amils (Universidad Autónoma de Madrid, Spain); Viggo Thór Marteinsson (MATĺS ltd., Iceland); Pascale Ehrenfreund (Leiden Institute of Chemistry, Netherlands); Felipe Gomez Gomez (Instituto Nacional de Técnica Aeroespacial – Centro de Astrobiología, Spain); Christine Moissl-Eichinger (Medical University of Graz, Austria); Frances Westall (Centre National de la Recherche Scientifique, France) and Nicolas Walter (European Science Foundation, France).